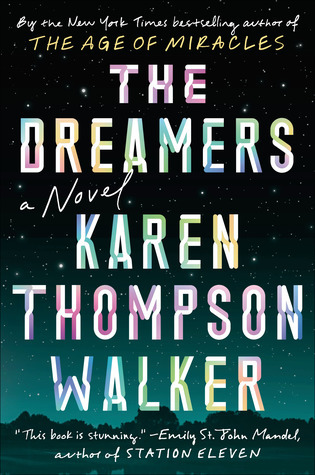 ‘The Dreamers’ is a book that I’d already read a lot of reviews about when I started reading – and they were very different ones! I was very interested in what this novel was going to be like. Many people loved it, but also many people said they expected something better. Finally, I read it, too, and here is my review! I got this book from Random House and NetGalley, in exchange for my honest and unbiased opinion. I don’t remember. Honestly. I don’t think this has ever happened to me. I know I saw it on NetGalley in October, and it sounded (and looked) good, so I decided to read it. I don’t even remember if I got accepted or it was under ‘Read Now’. Nothing. Actually, there are several books that I downloaded at the same time, that’s possible the reason I don’t remember them separately. After downloading a book, I haven’t given it much thought, because the publication date was so far away – until a couple of weeks ago, when reviews started to pour down on me from everywhere. That’s when I got super-interested in this book again. Unfortunately, I seem to be among the people who were left unsatisfied with this book. It started out with a great promise. Not just according to the description, but also while I was reading the first couple of pages/chapters, I thought, wow, this is good. The writing is beautiful, but not overly-flowery, it creates an atmosphere that’s a perfect match for the story, and the characters seemed to be interesting. The pacing was good. Why, I thought I was going to be a part of the group who loved this book! Then my feelings about it shifted. More and more, little step by little step, and by the end, they were completely different. I wasn’t interested in the characters anymore. I vaguely cared about the story, but my attention kept wandering elsewhere. I felt detached. I saw several reviews that stated it’s the numerous, equally important characters that makes them so hard to feel for, to relate to… that keeps them from being completely formed. I think it’s probably part of it, but for me, the main reason was probably the style. Which is so ironic, because the style was so amazing at the same time. Unfortunately, what worked perfectly for the story and creating the atmosphere was a complete failure character-wise. And the tragedy of it is that I’m pretty sure there would’ve been no way for both to work. It’s either that dark, shocking, but impersonal way of storytelling, that makes the reader feel like they’re reading a relatively objective report about the events, that makes us feel that collective dread – or a writing style that lets us know the characters, individually (possibly a couple less ‘main’ characters, though), so we feel personally for them, we learn about them, and get attached. I get that these things are probably incompatible. And I’m pretty sure that’s why there are such big differences between reviews: some people are completely fine with the first version, and others would prefer the others. I’m a very character-driven reader (not only reader, in fact, even in movies I prefer that), so it wasn’t really a book for me, but I can see why other people might like it very much. My only other problem was the ending: it was fine regarding most angles, but we learnt basically nothing about this ‘sickness’, and by the end that was the thing I would’ve been most interested in. That might be my bad, though, because this book is labeled a ‘literary fiction’ on NetGalley, and if I look at it as that, it’s okay, I guess – I simply thought of it more like a science fiction novel (according to the blurb), and maybe that’s why I expected something else from it. The writing style was exceptional! The wording was eloquent and beautiful, not too much, but just enough. It created a perfect atmosphere for the story. People who prefer plot-driven stories to character-driven ones. Though this didn’t become my favorite book, based on the author’s style I’d like to read something else she’s written! Even after reading a book that’s not really for me, I can tell she’s very talented. Have you read this book? (Seems like a lot of people has already.) What did YOU think? Have you read the other book written by K.T. Walker? Also, leave a comment if you have a review of this book! I’ll add it to my list here! I’ve not read this book but thought the synopsis sounded super interesting! After reading your review I don’t think I’m in any rush to pick it up. I honestly thought it would be more sci-fi as well. Great review! Thank you! ❤️ Yeah, I was so disappointed… There are people, though, who liked it more than I did, so I guess it works for some readers. NIce, honest review Dora. Too bad this one didn’t measure up. You are so right that when reading mixed reviews the only way to see where you fit is to read it, unfortunately, you were in the meh group. Drinking Tequila Gold with a book tells me something. Glad I did not request this one, better luck with your next book.